Emma Vaile is the most powerful ghostkeeper in centuries - which is great for battling the wraith master, Neos, but awful for her social life. Emma knows fellow ghostkeeper Bennett Stern is her soul mate, but when ghostkeepers fall in love, the weaker one loses all power. And until Neos is defeated, Bennett and Emma can't risk it. When the temptation of being with Emma gets to be too much, Bennett disappears. Heartbroken and alone, Emma tries to lose herself in school. But when the Knell, a secret ghostkeeping society, sends two new ghostkeepers to Echo Point, Emma throws herself back into training to battle Neos. As the team grows stronger, so do the ghosts. And worse, one of their own will betray them. One Emma never suspected . . .
With Emma trying to cope with the devastating events at the end of the first book and on a sharp learning curve when it comes to her ghostkeeping abilities she is going to need her friends more than ever. Unfortunately Sara and Harry blame her for what happened to Coby and Bennett has done one of his vanishing acts so she finds herself more alone than ever. Luckily she still has Natalie to rely on and she is kept busy training so that she can fight against Neos. 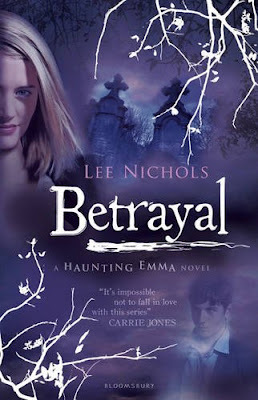 I loved Deception so had been really looking forward to reading Betrayal. Unfortunately it didn't quite manage to live up to my expectations but it was still a good read and has left me looking forward to the final installment, Surrender, later this year. I loved the fact that there was more action in Betrayal, the story has a much faster pace and kept me on the edge of my seat with some surprising twists and turns. Now that Emma is aware that she's a ghostkeeper she is working hard to learn how to use her abilities against Neos. She is determined to do whatever it takes to bring him down but she isn't going to be able to do it alone. She has some surprising allies but she is also going to face some shocking betrayals, one in particular that really upset me. I enjoyed finding out more about the Knell although I have to say that as a supposedly powerful organisation they seem rather weak when it comes to protecting themselves. I did like getting to know Lukas and Simon though and it was interesting to see the dynamic between them, Emma and Natalie as they all learnt to trust each other and work together. I think what I missed most were the interactions with Emma and Bennett, I really loved the two of them in Deception and wanted more of that. Things started off really well but then Bennett disappears for most of the book which was disappointing. When we do finally see him again I found myself annoyed with some of the decisions he has made and I'm concerned about how things will play out in the future. I had also hoped to find out more about Emma's family in this book, I want to know more about why they have abandoned her and exactly what they are up to but it seems like I'll have to wait for the next book to get answers to all of my questions. Although I didn't think this installment was quite as strong as the first I'm still really enjoying the Haunting Emma series and am looking forward to finding out what happens next. The mythology Lee Nichols has created is unique and I'm enjoying finding out more about the ghostkeepers. If you haven't picked up this series yet then it's one I would definitely recommend but you do really need to start with the first book Deception before you pick up Betrayal. Source: I was given this book by the lovely Carly from Writing from the Tub, thanks Carly!